Rolf’s last post about “managing our expectations and emotions” accurately describes the emotional valleys we encounter as we continue to live “in limbo” alongside Rudy. Although we struggle with Rudy’s uncertain future, there is comfort in watching Rudy enjoy life to the fullest…I’m not sure it’s accurate to say that he is “blissfully unaware” of the battle he is in but he certainly doesn’t know any different and there is very little that steals his joy and smile. Today was another perfect example of how heartache and deep, deep joy coexist in this crazy journey. 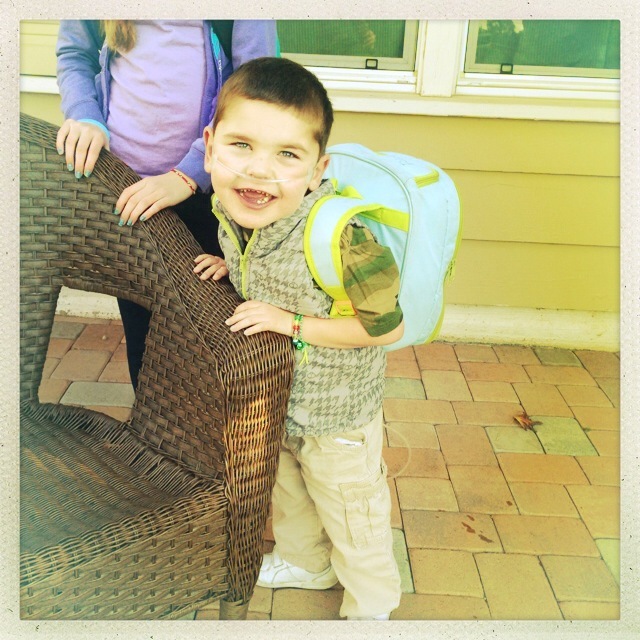 After months of discussion and planning, Rudy had his first day of Kindergarten at our neighborhood school today! 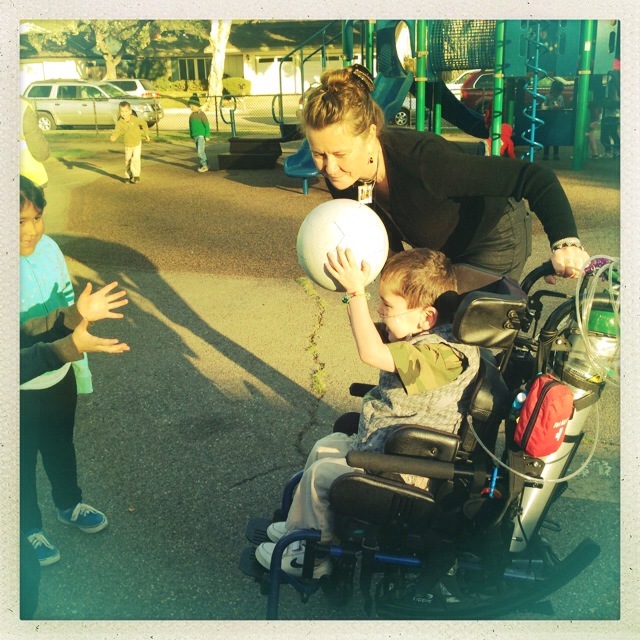 His modified schedule includes Mondays at La Patera and Tuesdays through Fridays at his current special ed school where he will continue to work on specific goals and receive special services. Knowing that this year was going to be a bit of a transitional year for Rudy as he moved from a county program to our local school district a full year before his formal Kindergarten placement, I requested that he have an opportunity to attend our neighborhood school where he and Olivia could have a shared educational experience and where he would have a chance to interact with neighborhood friends (i.e. gal pal Stella). 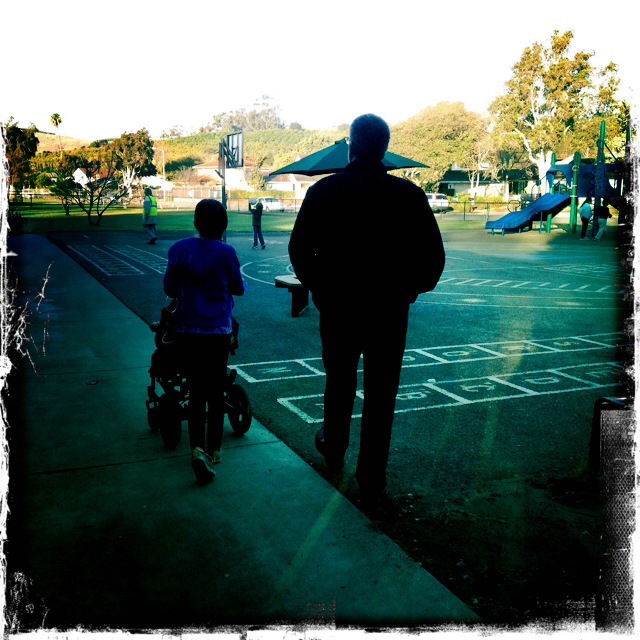 Rudy will likely go to another Goleta school next year with an established special ed Kindergarten program and because Olivia will be headed off to Junior High next year, this is their only chance to go to school “together”. Needless to say, we’re all so thrilled that the district and LP community were willing to work with us, see the mutual benefits for all involved and welcome Rudy into the classroom mid-year!!! Everything about today was precious. The day started when we pulled up to the school and Rudy said “Bye, I-ya (Olivia), see ‘ya” to which Olivia replied “Rudy, you’re coming too!”. 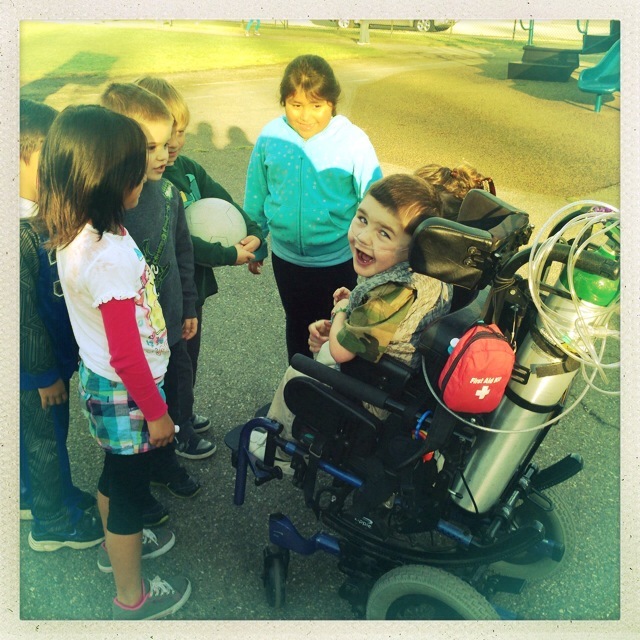 The minute we got out of the car and headed to the Kindergarten playground, Rudy’s excitement was undeniable…he was quickly surrounded by classmates who were told last week that he would be coming and he bonded with some of the kids over basketball. We are overjoyed that Rudy’s school nurse, Nurse Sara, is able to accompany him at both schools…her support and the continuity of care that she can provide no matter their location is crucial and such an amazing gift. Time to meet new friends! Rudy was happy and excited the minute we walked on the Kindergarten playground! 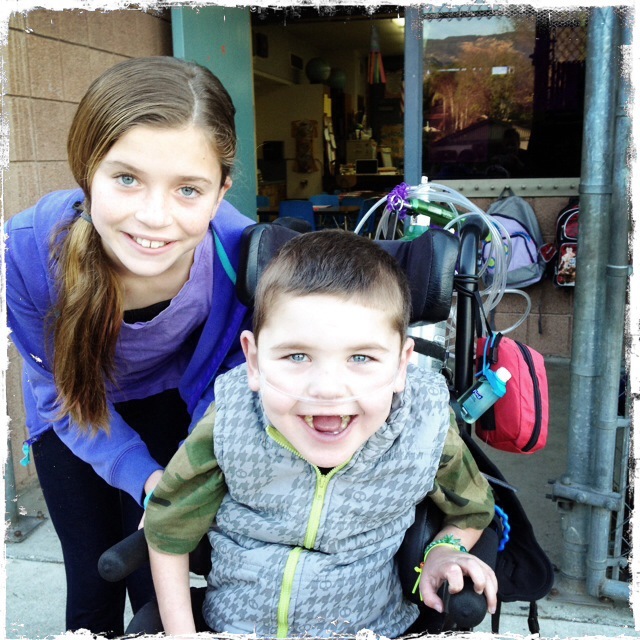 Rudy and big sis together at school! …and sharing a BIG smile with ol’ friend Stella!! When Rolf and I arrived to pick Rudy up, big sis was helping in his classroom during her lunch break and Rudy was playing on the computer with friends. We had a hard time tearing him away and it all clearly made a big impression because the first thing Rudy said to us was “Dad, Mom! Neat game!!”. 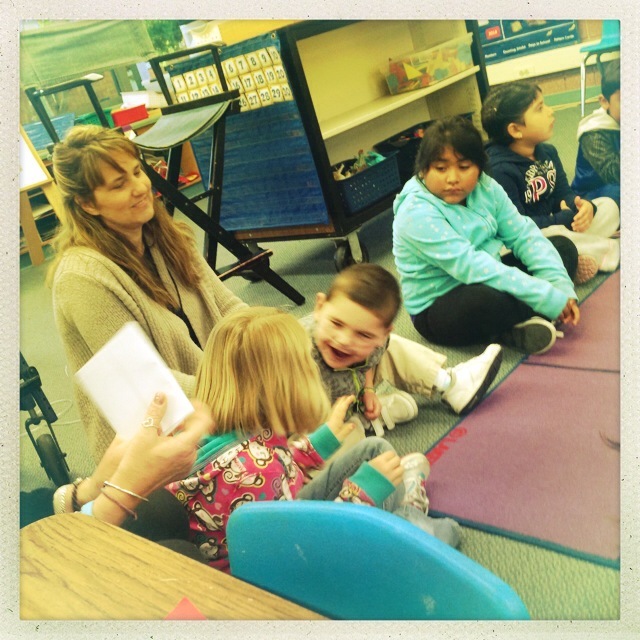 Nurse Sara and Mrs. Farrington confirmed that Rudy had a great first day filled with smooth transitions between activities, positive interactions with the other children and a happy demeanor…a happy heart! As a result, our breaking hearts are happy too…a curious combination. 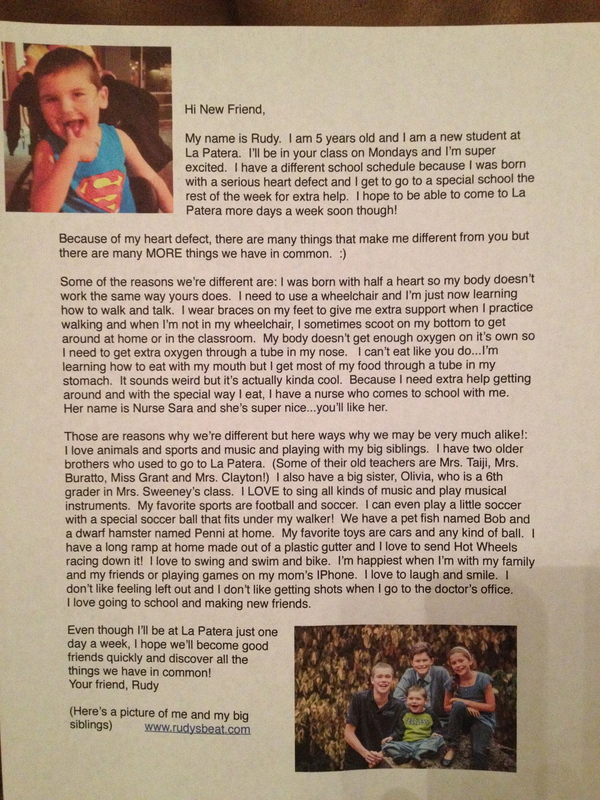 a note from one of Rudy’s classmates…precious! 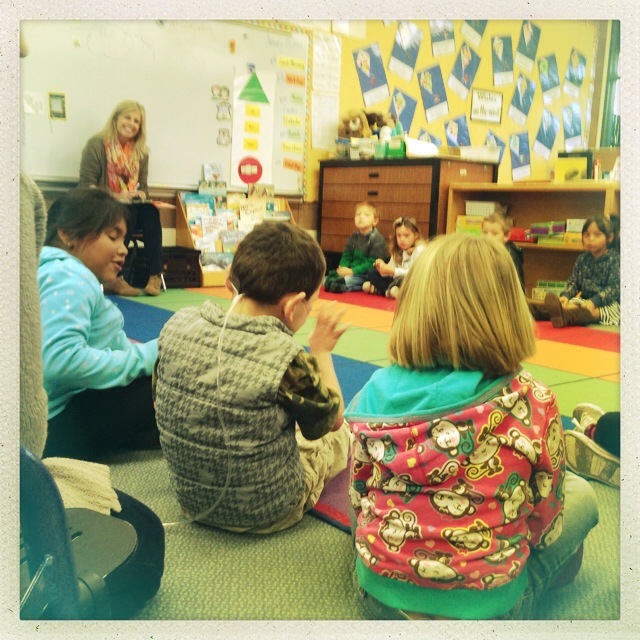 …a letter introducing Rudy to his class. Once again, the way you all face challenges is amazing. I am so happy for Rudy and Olivia. Joy is the word for this news. I know how much your family wanted this to happen and I am happy for all of you. 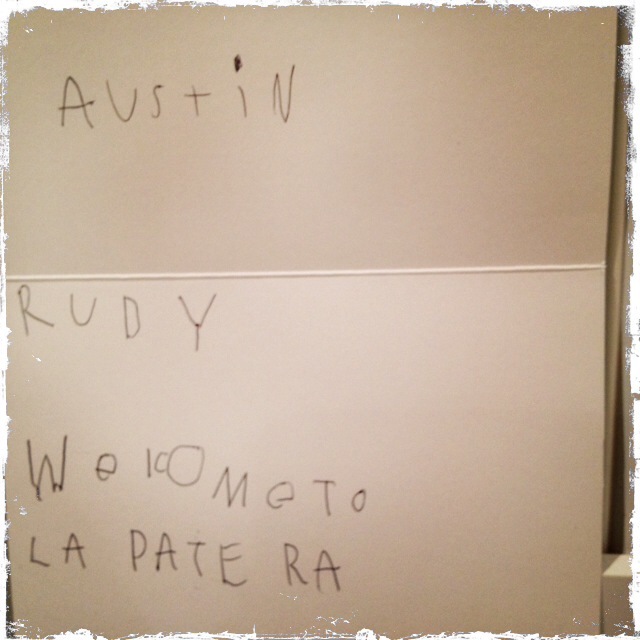 Olivia is such a sweet part of this story and she will be a great influence on your experience at La Patera, Rudy. Have fun with your classmates! Jesse saw the picture of Rudy standing, wearing his back pack and said “Oh my gosh, Rudy has gotten so big, he is so handsome, makes me want to cry” 🙂 I personally am overwhelmed with joy to see all of these new experiences for Rudy. He is such a beautiful, happy boy! Your whole family is filled with such great love and it shows in every smile. I know you are probably sick of hearing this but we miss you all like crazy!!! My heart hurts to have to watch the kids grow from afar, but we are just blessed to have you all in our lives. We love you! God Bless! The School is very lucky to have Rudy, he will teach these children many lessons and they will have one of the finest friends someone could ask for. and a smile that lights up their day. What joy, to see Rudy and Olivia so happy. That little boy is glowing. Bless you ALL. The letter you wrote to Rudy was, to use your special word, precious – super precious. It melted my heart. I want to be his friend! I want him to be in my class! I want to see his cool eating thing!!! You will do amazing wonders for not only Rudy, but for lots of other children and parents and teachers, as well! His heart is big enough to be shared in a super big way. How precious!!! Big boy Rudy!!! Love the letter you wrote to introduce Rudy….I think I’ll read it to my class. I CAN’T believe Livy will be in Jr. High next year!!!!! Hugs to the school boy!!!! As usual…I am almost speechless, when I try to read the blog and understand the impact this family has had on so many people. Rudy, is beyond amazing, and I know God keeps him going everyday, filled with a joy and happiness, despite his serious impediments, that touch every persons lives who know him. And the love poured into Rudy, by his siblings and his parents, is a testimony to each of us who follows this, of a dedicated, sacrificial, God loving family we are so priviledged to know. Go Rudy…God bless you and your wonderful family. Have a super school year and stay strong! I am so happy Rudy’s first day was a big success…of course I knew it would be, with his team of loving supporters and a welcoming class and school. Marking new ground, and setting the path for more success to come – go Rudy! Yeah Rudy! Love that smile. The letter written to his classmates on his behalf …. I think all students would benefit writing one about themselves.